Spinarak in game: 3,857 Who? Important notice! Pokemon Spinarak is a fictional character of humans. 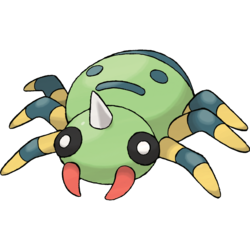 Spinarak is a green, arachnoid Pokémon. It has black eyes with white pupils, a white horn on its head, red mandibles, and six yellow legs. A greenish-black stripe encircles the middle of each leg and the end of its abdomen. The greenish-black spots on its abdomen resemble a face that has been shown to change expression in the anime. Spinarak is a patient hunter that can wait motionlessly for several days for unsuspecting prey to become trapped in its thin yet strong web, which it weaves in the forest. It is even said to be able to identify what kind of prey is in its web just by their vibrations. Spinarak first appeared in Spinarak Attack. Officer Jenny in Catallia City use Spinarak rather than Growlithe in order to honor the Spinarak that foiled a notorious cat burglar known as The Black Arachnid. Bugsy's Spinarak debuted in Gettin' The Bugs Out. In Ariados, Amigos, five Spinarak appeared at the Pokémon Jujitsu Academy, where their silk was being used as beauty masks. One shared an antagonistic role with a Swampert in Abandon Ship!. One belonging to Sebastian appeared in The Treasure Is All Mine!. Misty chased away a Spinarak in The Bug Stops Here after it scared her. Dr. Anna had Spinarak make bandages for her patients in Hassle In The Castle. A Spinarak owned by an unnamed Trainer briefly appeared in Imitation Confrontation. A Spinarak dropped in front of Misty in UnBEARable. Multiple Spinarak appeared in Celebi: Voice of the Forest. Several Spinarak protected the Tin Tower after Team Rocket stole the crystal bells in For Ho-Oh the Bells Toll!. 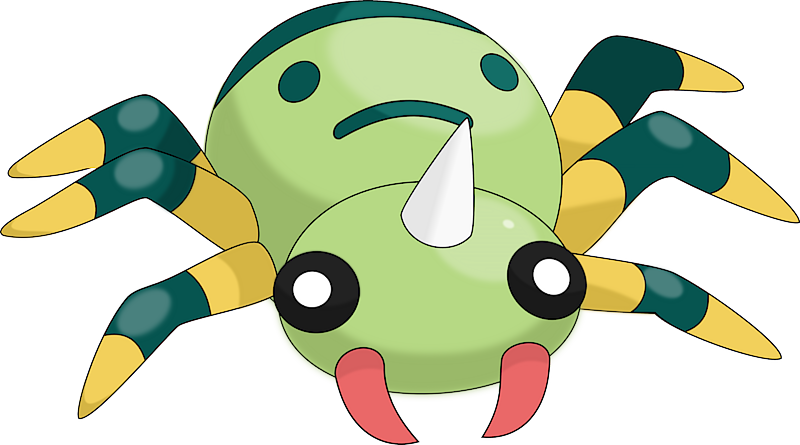 In Talkin' 'Bout an Evolution, Team Rocket's experiments made Pokémon feel sick, including a Spinarak. Three Spinarak covered Misty with strings in Hocus Pokémon. A Spinarak was in a forest outside the Ice Path in EP250. A Spinarak was in Professor Oak's Laboratory in Showdown at the Oak Corral. A picture of a Spinarak appeared in the gallery museum in A Blustery Santalune Gym Battle!. Two Spinarak appeared in A Full-Strength Battle Surprise!. Spinarak debuted in The Legend where one was seen spinning its silk down from a tree when Green had finished her message to Silver in Johto. One of Team Rocket's elite operatives owns a Spinarak that uses its webs to trap its targets which it first appeared in Into the Unown. It appeared again in Miltank Melee where it was used in an attempt to capture Suicune.It temporarily fell asleep by Parasee's Spore in Iduibitably Ditto. It was later used to make a Spider Web surrounding Eusine and Harry in Great Girafarig, after Harry's Girafarig had been defeated it along with Ken's Elekid had quietly escaped. Cyrstal mentions that she captured a Spinarak on her way to Professor Elm's Lab in Three Cheers for Chikorita. A Spinarak appeared in The Last Battle XIII as one of the Pokémon sent to help the fight in Ilex Forest.